The bridge as viewed from Putnam Hill Park. Probably one of the more unique infrastructure sights along the National Road is the Y-Bridge in Zanesville. 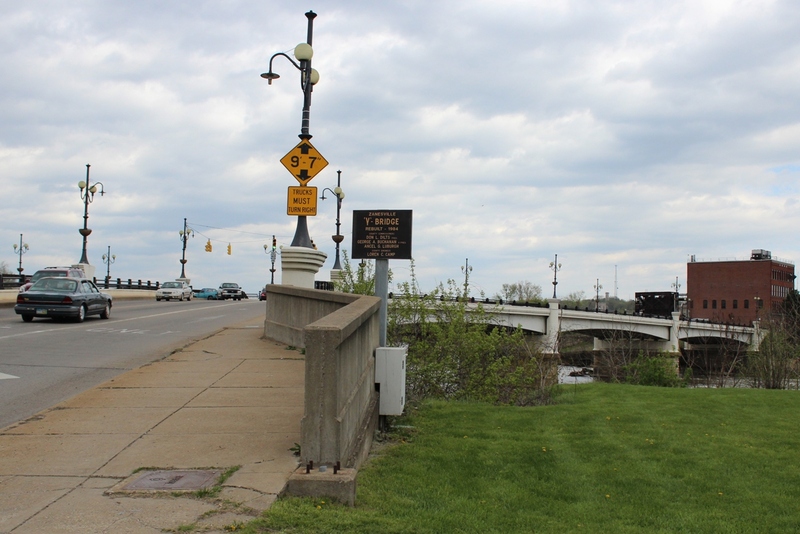 Spanning the Muskingum River at its intersection with the Licking River, the bridge serves as a major traffic artery for the downtown area of the city. What makes this bridge special is the fact that there is a three-way intersection in the center of the bridge, controlled by a stoplight. The bridge from Muskingum River Parkway State Park. Though the history of a y-bridge at this location spans almost 200 years (no pun intended), the current bridge was built in 1984 – the fifth such structure. The original bridge, built in 1814, met its demise by falling into the river, and each subsequent bridge was eventually deemed unsafe and had to be rebuilt, producing the current bridge as it is today. 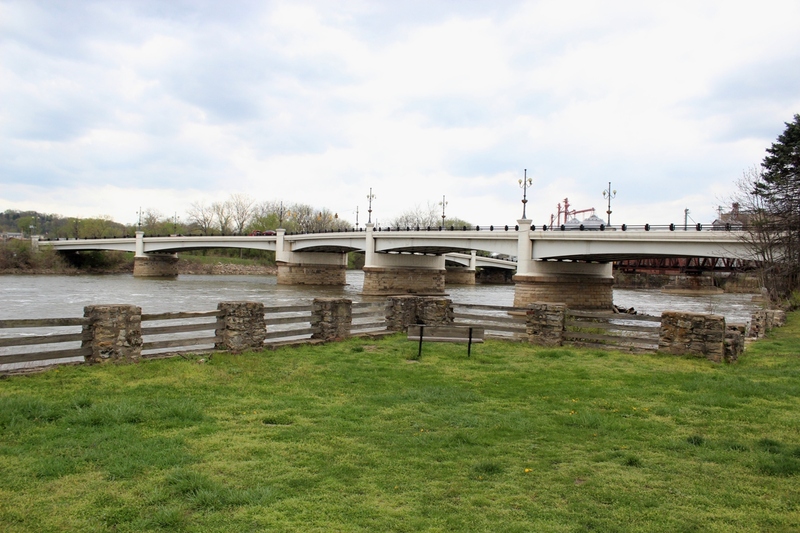 Since the first bridge was built, the uniqueness of its shape resulted in the bridge becoming a local tourist attraction, and Muskingum County, the City of Zanesville and the Zanesville-Muskingum County CVB all maintain webpages featuring the bridge’s history. As for the tie-in with National Road history, the N.R. was routed across the bridge in the 1830s, as the road was being built across Ohio. The U.S. Route 40 mainline is still routed across the bridge today. A sign at the southwest entrance to the bridge. There are a few options for viewing the bridge that I found when I visited. Probably the best spot for seeing the bridge up-close is a parking lot on the grounds of Muskingum River Parkway State Park, which I personally had no idea existed (and is pretty cool in and of itself!). This turnoff for this area is located immediately before crossing the bridge at its eastern end (on the left if driving west, on the right if driving east). The second option, which gives a nice aerial view of the bridge, is at the top of a hill south and west of the bridge. The viewpoint is part of the city’s Putnam Hill Park. The city has signs directing drivers to this spot from U.S. 40. I’ve included a map of both of these locations below. Of course, the Y-bridge isn’t the only unique bridge along the National Road. Two other bridges, one in Wheeling, and one in Grantsville, Md., have also piqued my interest, as have the numerous S-Bridges in Ohio and Pennsylvania.